El ejército alemán solicitó que los tanques de la serie E tuvieran la transmisión posicionada en la parte trasera del chasis. Sin embargo, los E-50 y E-75 usaban el compartimento de motor-transmisión del Tiger II, el cual hacía imposible colocar la transmisión en la parte trasera. El E-50 Ausf. M fue un rediseño del proyecto E-50 con la colocación de la transmisión en la parte trasera. Lower frontal hull and turret face are lacking in protection. However on the down side, the E50 M's armor profile isn't perfect. The turret and lower front plate are the prominent weak spots. The front of the turret has a high armor value, but barely any slope, meaning most guns it comes across can penetrate it. And as per the norm of German tanks, the lower front is exposed and relatively weak. 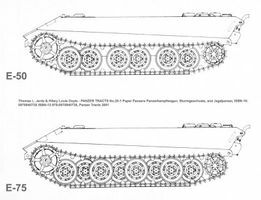 It can be expected that almost every time, shots will penetrate the lower front unless the enemy is a light tank or firing high explosive ammo. However, the 50 M is special in the case of the lower glacis plate. It lacks the traditional frontal transmission found on nearly every German tank, which means that you can no longer have engine damage or be caught on fire from a hit to the lower glacis plate. In addition, although the 50 M has very good accuracy and penetration, the damage per minute is sadly the worst in its class, as every other tier 10 medium has better DPM which they can use to pump out damage even faster. However, at range where said tanks might miss a lot, the 50 M still has the upper hand. In all the E50 M is a very well rounded tank. It's got high speed and good armor, a powerful, high penetration gun with laser like accuracy and good aim time and accuracy spread, and a usable amount of health. Up close or afar, you are never really out of this tank's killing zone.